Can I run Readerware Mobile on my Amazon Fire Tablet? Readerware Mobile is available for download from the Google Play Store, it is not currently listed in the Amazon App store. So how do you install it on an Amazon Fire tablet? You can install it right here from the Readerware web site. Before continuing bring up this knowledge base article on your tablet using your mobile browser. 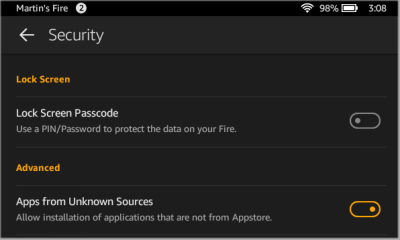 You need to turn on the "Apps from Unknown Sources" option. When you touch one of the above links, touch OK if prompted to download the app. When the download completes touch Open and the install will start. The ZXing Barcode App requires an auto-focus camera to scan linear barcodes. Not all Fire tablets include this kind of camera, if you see the barcode on the screen but nothing happens, chances are your camera is not auto-focus. That's it, you are now ready to begin using Readerware Mobile on your Amazon Fire Tablet. See the links below for help on getting started with Readerware Mobile and scanning barcodes.